Explore the Wichita Art Museum’s Art Garden, a lush landscape of trees, shrubs, perennials, grasses and sculptures alongside the Little Arkansas River. If you haven’t yet met Paul Melroy, the new Tallgrass executive director, come meet and mingle with him and other Tallgrass staff. Tallgrass Film Association puts on Wichita’s amazing Tallgrass Film Festival each October. Have a summer picnic. Pack your own grub or bring cash to enjoy food and beverage from a gathering of food trucks that will convene for the event. Move to some of the best dance music from the 1980s courtesy of the band The Astronauts, which will start playing at 7 p.m. Check out Jump!Star, a multi-disciplinary collaborative project involving Tallgrass Film Association, Chamber Music at The Barn, Symphony in the Flint Hills and Harvester Arts. New York-based artist George Ferrandi is the creator and director of the project that is also funded by a National Endowment for the Arts grant. At 9 p.m., have a seat and enjoy the screening of “Arrival,” a 2016 science fiction thriller and Academy Award-nominee for Best Picture. The film tells the story of a linguist recruited by the military to communicate with alien life forms after 12 mysterious spacecraft land around the world. 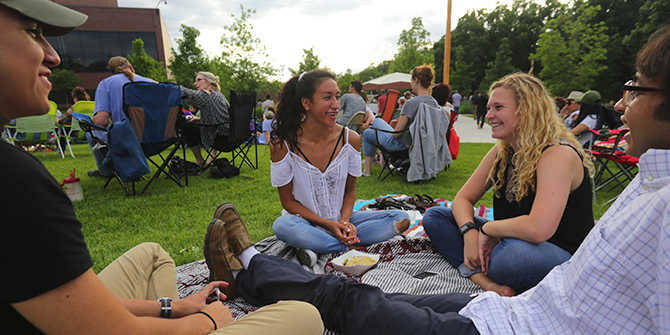 Remember to bring your own chairs or blankets, as the limestone seating in the garden’s amphitheater is limited.